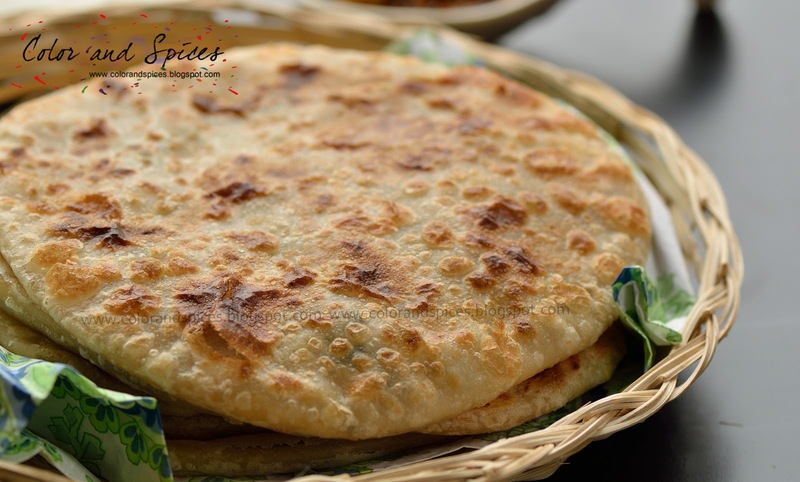 Aloo-paratha (potato stuffed flat bread) is a popular dish from North India. The main ingredients are potato and flour. 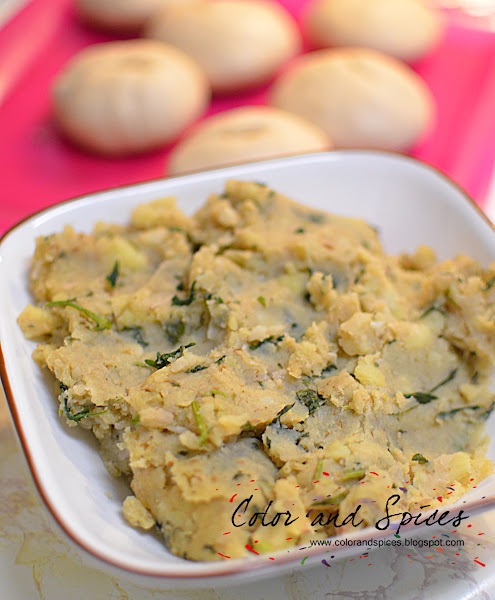 Pre-cooked potatoes are mixed with various ingredients and spices to make the stuffing and then the flour dough is stuffed with this specially made potato stuffing and rolled into flat bread and then shallow fried in a tawa(flat pan). It is usually served with a dollop of butter, yogurt and pickle. 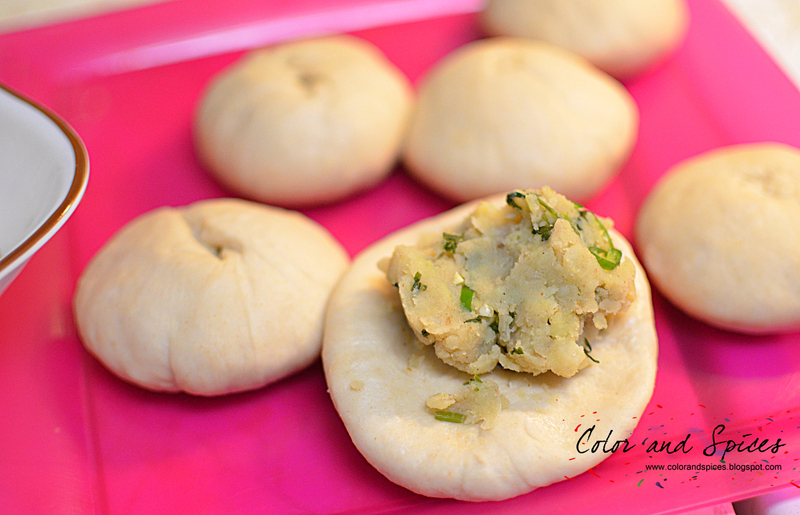 Aloo ke paranthe as the North Indian's call it or aloor porota as the Bongs call it, is one of my favorite breakfast. I usually make these for leisurely weekend mornings. And oil to fry the parathas. 1. Wash the potato and cut into half. Cook the potato in a pressure cooker or in a large pan. When the potatoes are cooked, drain them and let them cool down. Peel the potatoes and mash them. 2. 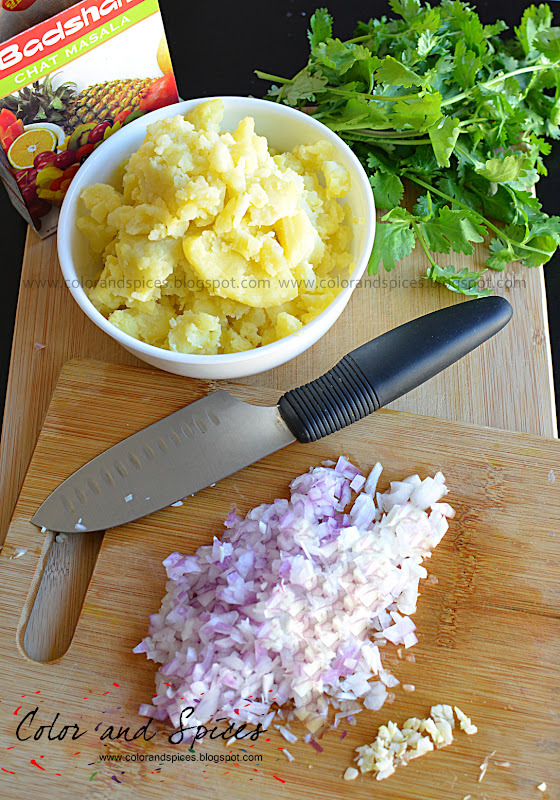 In a kadai or pan add oil, when the oil is hot add chopped onions, cook till transparent. Add the minced garlic. Cook for 2-3 min. Add mashed potato, cumin powder, red chili powder and black salt. Mix well. Keep stirring so all the ingredients mix well and no lumps are left in the potato. 3. Add green chilies, chat masala, lime juice and mix well. Check the salt, if needed add some salt. Add handful of chopped fresh coriander leaves. Mix well. Cook for 2 min. Switch off the heat and let the stuffing cool down. 4. For the dough mix all the ingredients well. Gradually add lukewarm water to make a soft smooth dough. Knead the dough well. Cover the dough and let it stand for 20-30 min. Uncover and knead again for 3-4 min. Make equal size balls from the dough. 5. Take one flour dough ball and flatten it with hand and put potato stuffing in it, close the dough. 6. 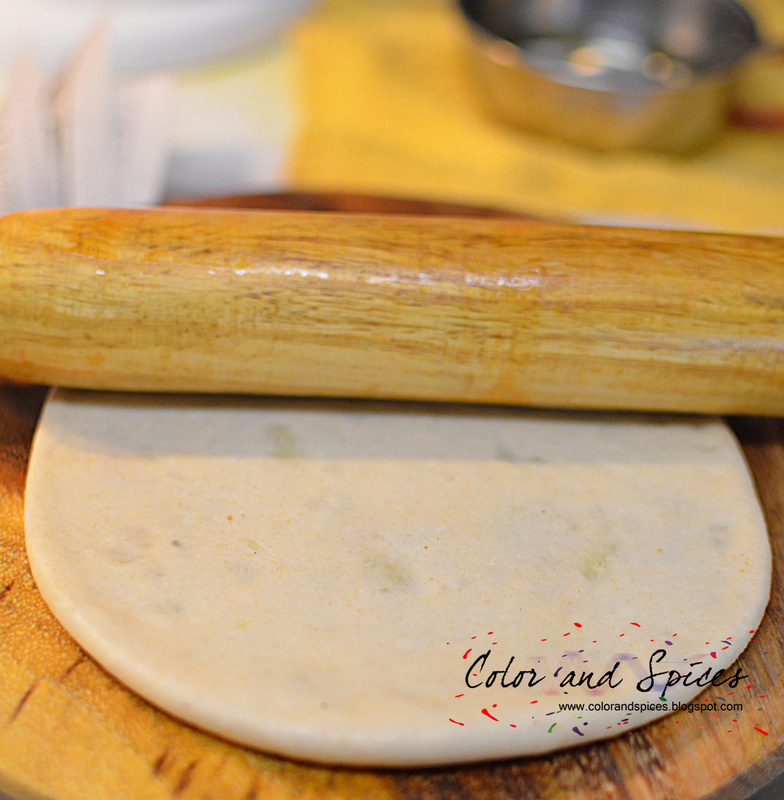 Gently roll the stuffed dough ball with a rolling pin. For ease, either dust the base with flour or grease with some oil before rolling. I prefer to use oil to grease the surface before I roll the dough. Make sure not to press to hard or the stuffing may burst out of the dough. 7. Heat a tawa or flat pan, when the pan is hot put the rolled paratha and cook over medium heat till red-brown spots appear. Turn sides to ensure even cooking. 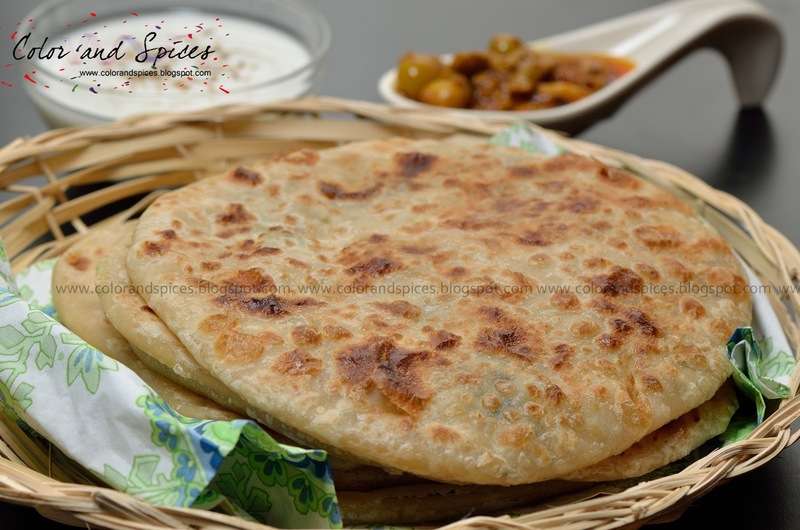 As the red brown spots appear and the paratha tends to puff increase heat to high. Add 1 teaspoon oil and fry both sides over high heat for 1 min. 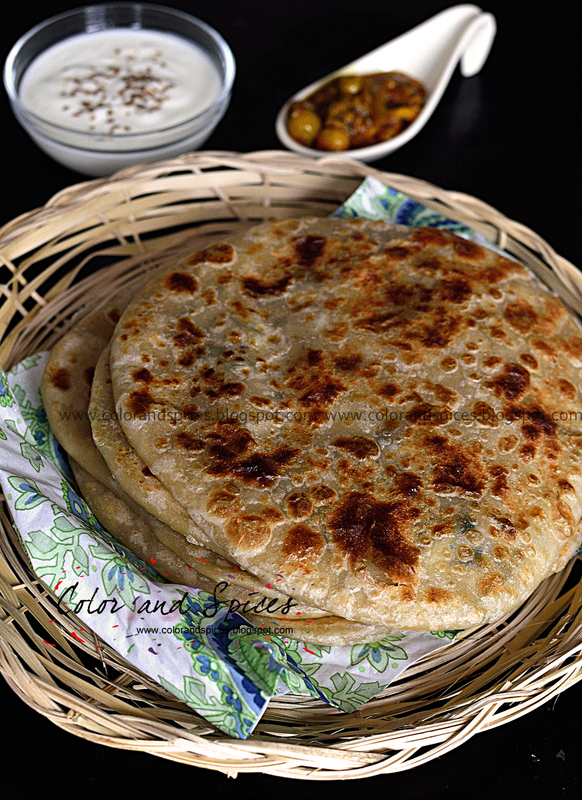 Serve hot parathas with yogurt and pickle or some fresh homemade butter.